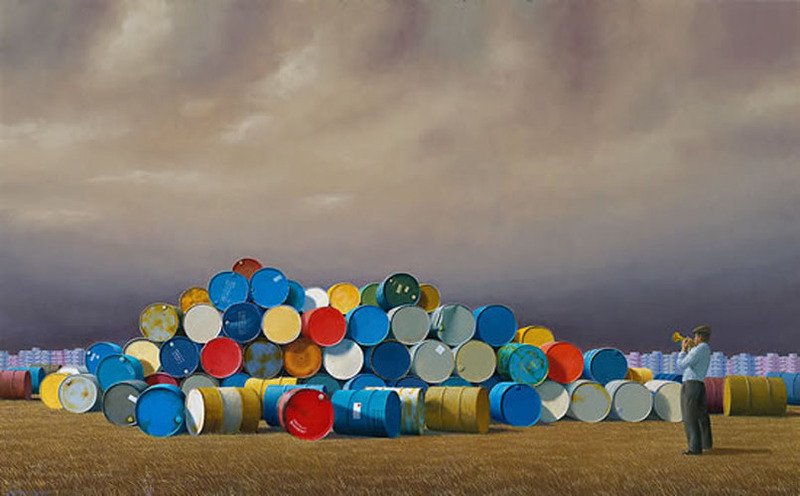 This is a image of the original oil painting by Jeffrey Smart titled The Oil Drums 1992, it is a Hi End Quality Australian Fine art limited edition reproduction image made digitaly on Arches paper, the work is digitally signed and titled Jeffrey Smart and carries his Seal of copyright, it comes complete with certificate of authenticity upon request, Etching House Lay Buy is welcome. Jeffrey Smart, born in Adelaide in 1921, is the modern Australian painter whose paintings look least Australian. Since his second trip abroad after World War II became a permanent stay, he has been painting that strange yet immediately recognizable area of the planet that his admirers call the Smart Country, a stretch of territory so completely international that one of its characteristic locations is an airport. We might not know where the airport is, but we recognize the lights and signs and colours: it’s a visual language at least as precise as any verbal one. Stamping their geometry on his landscapes, Smart’s buildings are part of the same language. Like all the unsentimental lovers of modern material forms from his teacher Léger through to the American hyperrealists and beyond, he was able to see the purity in shaped metal and concrete. If there is an endemic Australian quality, it might be in the confidence with which he not only combines the functional exuberance of modern industrial life with the iconography of the past, but equalises and balances those two things, so that a Matisse poster in the context of an Australian suburb becomes more lyrical than ever.